Happy February, everyone! 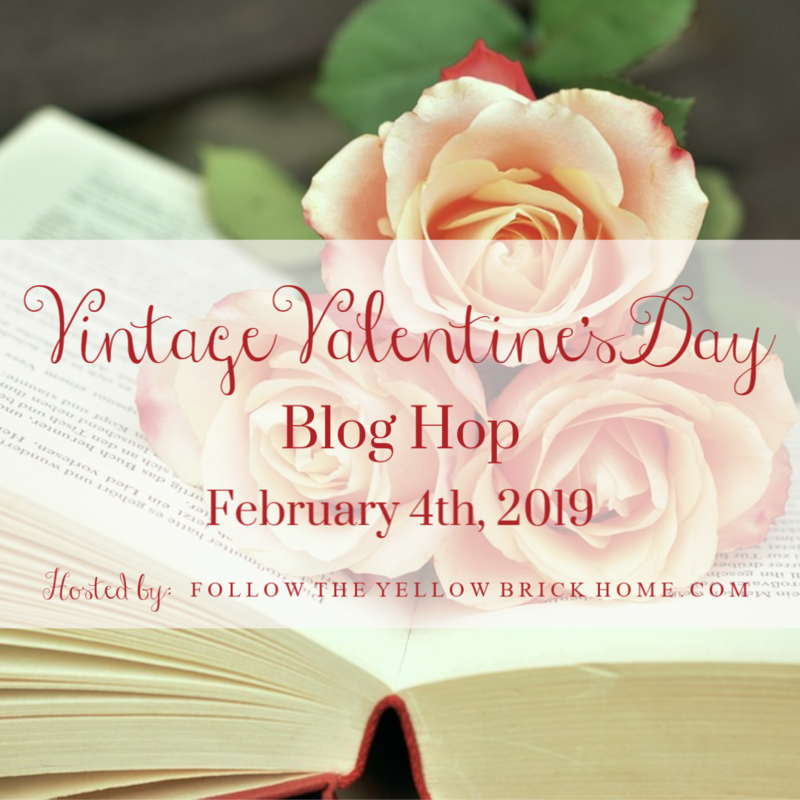 Today, I am excited to join a wonderful group of bloggers for a Vintage Valentine’s Day Blog Hop! 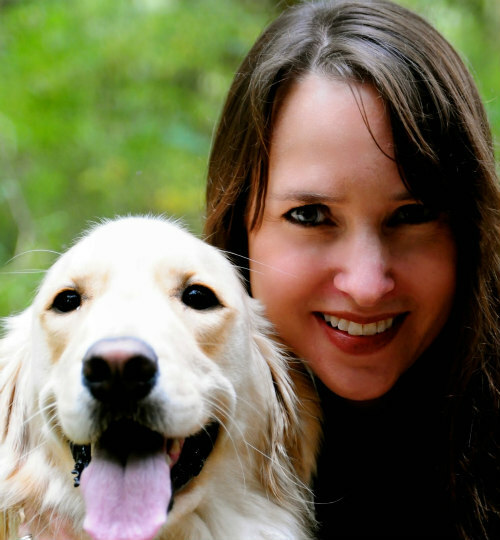 Thank you to Amber from Follow the Yellow Brick Home for hosting! At the end of this post, you can find a list of all the participants in the blog hop. Be sure to visit as many as you can for some creative Valentine ideas! If you are just arriving from County Road 407 …Welcome! I am sure you enjoyed Cindy’s beautiful table! I adore her decorating style and her lovely blog! Beginning with my first vintage inspiration…these napkins. A few years ago, my mother-in-law handed down these very special napkins to me. Aren’t they beautiful? She embroidered them herself and I am so honored to have them in my possession. Since she created them when my husband was just a baby, they definitely count as vintage! Although she gifted me a whole set, I chose the pink and white ones for my Valentine’s vignettes. In my first vignette, I paired the napkins with pink tulips. Of course, you have to have flowers for Valentines Day and you can’t go wrong with pink! This look could work beyond Valentine’s Day into spring. Ah, spring…the thought of it makes me smile after the frigid winter we’ve had so far! 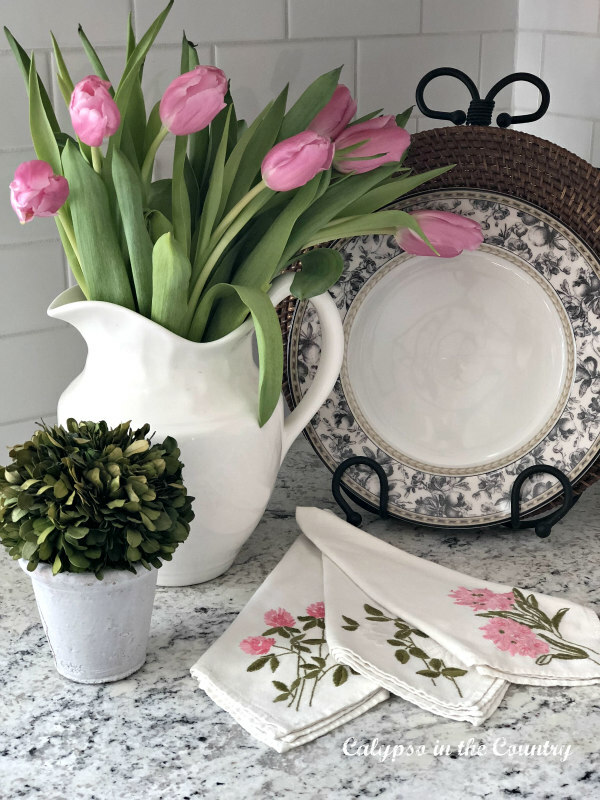 For more tulip inspiration, be sure to read my ways to decorate with tulips post. Besides the napkins, I knew I must have more vintage items around the house to work with. After all, I have been married for 20 years so basically half of our things should be vintage by now! My second inspiration – the silver bowl. Not only is it a pretty piece, but it has special meaning to us. The silver bowl belonged to my father-in-law who passed away a few years ago. Engraved on the other side of the bowl is his name and an award he received back in the 70’s. Since I thought it would look beautiful filled with flowers, I polished it up a bit and placed a grid of tape across the top. 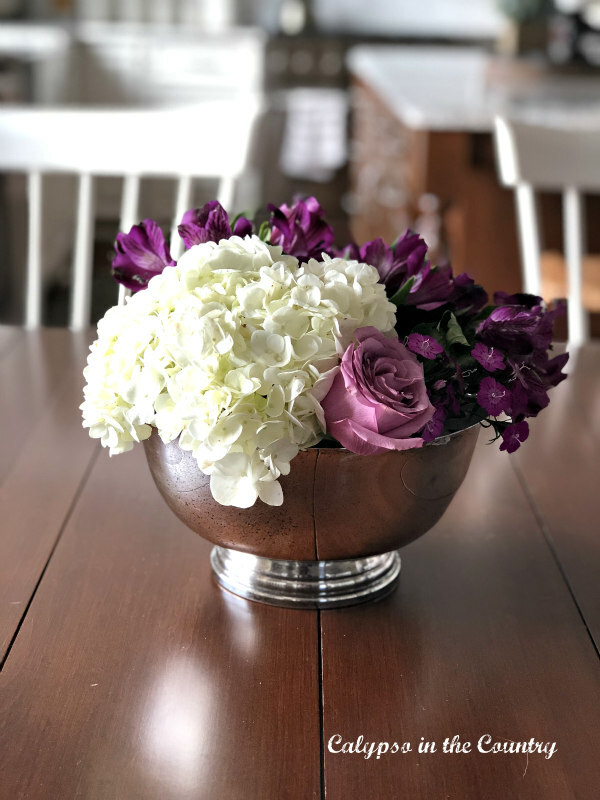 This is an easy way to arrange flowers in a bowl without having to use floral foam. After the tape was in place, I simply cut some grocery store flowers down to size and placed them into the grid. A fluffy hydrangea filled up a good portion of the arrangement and I used pink and purple flowers to fill in around it. Of course, I must remember to keep it watered. Luckily, I also came across a pretty ceramic heart that my mom bought for me years ago. A perfect addition to a Valentine’s Day vignette. From there, I grouped everything together in a wood tray I recently bought at World Market. We all love our trays, don’t we? With the addition of some pearls and a framed “I Love You” heart, the 2nd Valentine’s Day vignette was complete. 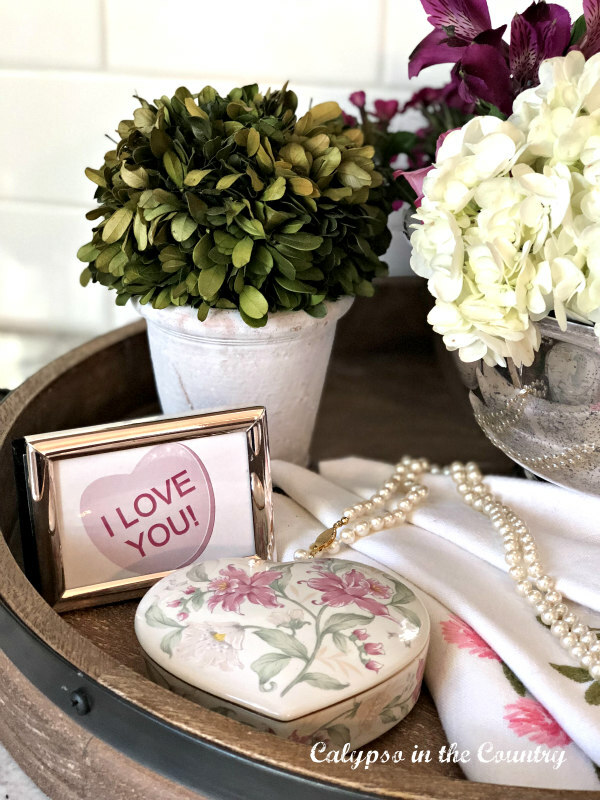 Lots of love in this vignette…I think we are ready for Valentine’s Day! Don’t you agree that sentimental items make decorating much more meaningful? If you look around your home, I am sure you will find special pieces you can use in your decor. I hope you enjoyed my Vintage Valentine’s Day Vignettes! Next, be sure to hop over to Bluesky at Home. Carol always has so many creative ideas and I love her style. I am sure she will inspire you as well! Remember to visit each of participants on the tour for tons of beautiful vintage Valentine’s inspiration! Thanks again for stopping by and enjoy the tour! This is so pretty. I adore tulips and they’re beautiful in that pitcher! Thank you! I love tulips too…I wish they lasted longer! 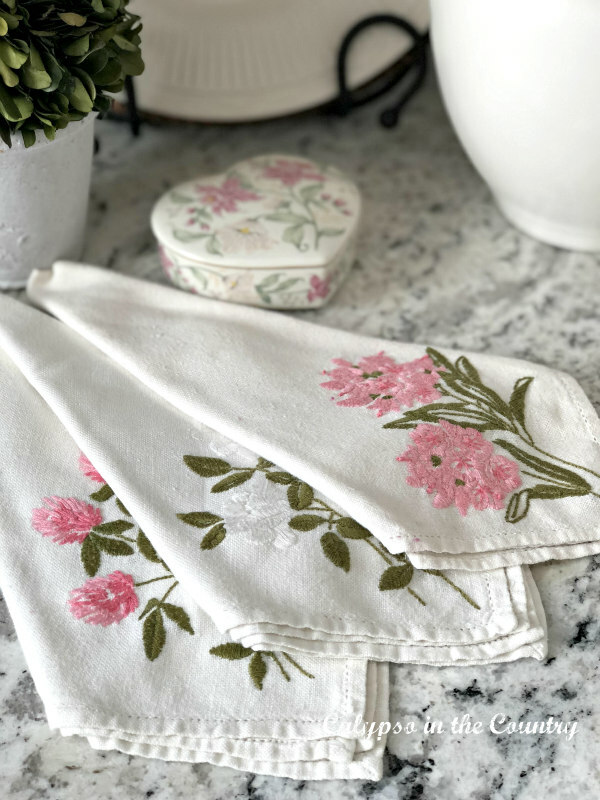 Your vintage napkins are so pretty and a wonderful treasure knowing who made them. Happy Valentine’s Day Shelley! Thanks, Michelle! Happy Valentine’s Day to you! Thanks, Cecilia! Yes, those napkins really are special. Great hopping with you! Thanks Alice! Have a great week! Thank you so much, Coco! Yes, I felt so honored when she gave them to me. Really a special gift. Thanks for stopping by and enjoy your week! Thank you, Cindy. What a sweet comment! Yes, I really do appreciate those napkins. They are so detailed and one of a kind! Great hopping with you! Both vignettes are so pretty! It’s wonderful that you mother-in-law made those napkins and that she gave them to you. What a treasure to own and something that you can pass along one day to your boys. I need to treat myself to some grocery store flowers. You tulips in the white vase and the pretty arrangement that you made for your father-in-law’s silver bowl both looks so pretty. 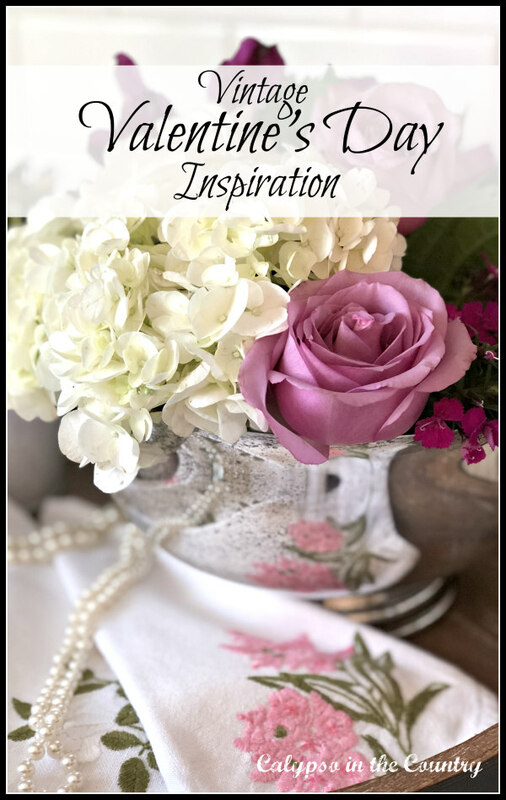 I’m loving getting so many great Valentine’s Day decorating ideas on this blog tour! Thank you, Paula! Yes, I was so touched that she decided to give them to me. I will definitely keep them stored so I can give them to our kids someday. This tour has been inspiring and so interesting to see what items people use to display. Such fun…great hopping with you! Thank you, Angelina! The tape makes it so easy and everything stands up the way you want it. Thanks for stopping by! This is lovely, Shelley! I Love how you used special family pieces…the napkins are treasures! It’s been fun joining you on the hop! Thanks Linda! Family pieces really make things meaningful. Great hopping with you too! I’m so inspired by your flower arrangement! From the silver bowl to the trick of the tape to the flowers you chose! All so beautiful! Using the tape is so much easier than trying to fit a piece of floral foam in there…and everyone has tape! Thank you so much for your kind words. Enjoy your week! I loved your vignettes! I especially loved the sentimental items you chose to include. THe flowers were beautiful my friend! Happy Valentine’s Day! Thank you so much. At first, I wasn’t sure if I even had anything vintage but it just took a little searching. Thanks for stopping by and Happy Valentine’s Day! Thank you! Enjoy your day as well! Beautiful vignette, the vintage feel is amazing and that floral is outstanding. Thanks for partying at Merry Monday! Thanks Jenny! It’s always nice to decorate with meaningful items…and flowers of course! Such a beautiful tray display. 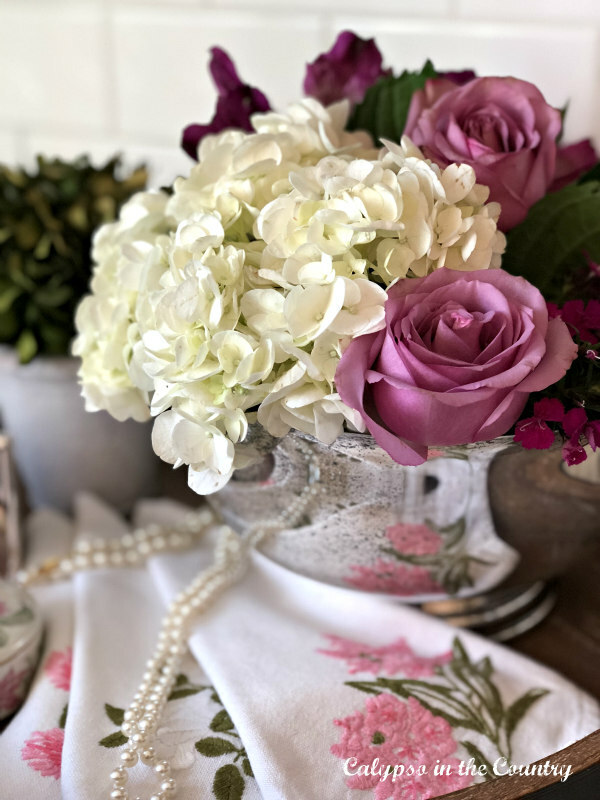 The vintage hankies and that gorgeous heart box are so pretty with your flowers and pearls. Beautifully done. Thank you so much, Marty! It’s always great to find things around the house to use in decorating! Enjoy your week! Both your vignettes are beautiful! I love the addition of the sweet napkins. I would not have thought of that. Heirloom pieces are the best! Yes, heirloom pieces are so great. It’s nice when our possessions have stories behind them. Thanks for your kind words. Your vignettes for Valentine’s are just so romantic and pretty! !I really need to go through my decor because I know I have items that I could use in these ways! Thanks so much for inspiring me beyond the traditional decor. Thank you Christy! I don’t think I would have thought to decorate with these pieces if it wasn’t for the blog hop. It forced me to really think about the things we have in our home. Thanks for your sweet comment! Those napkins are absolutely gorgeous. But, I’m not sure your husband would want to be included in the vintage category. I never think to use tape to create holders for floral arrangements. I need to remember that next time. Ha – he and I are both in the vintage category!! Thank you for your sweet comment! 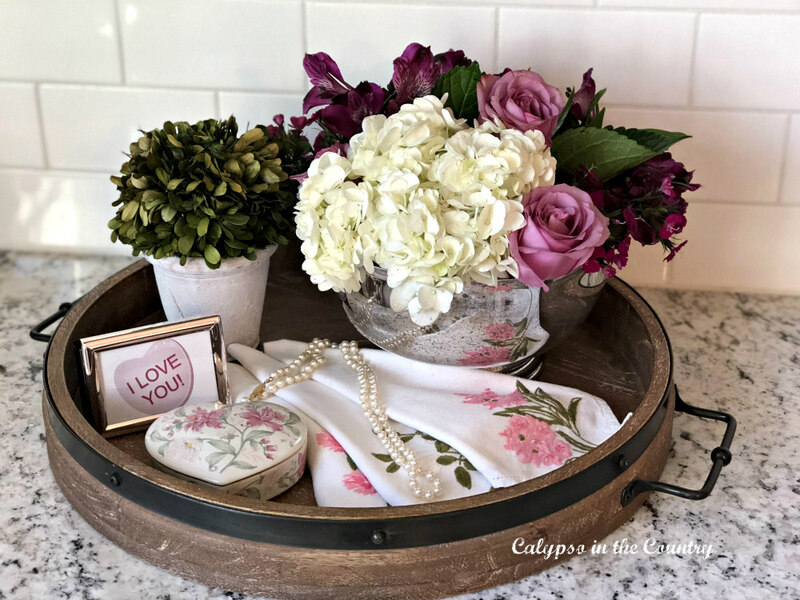 I just love the colors you chose for your vintage Valentine vignette! Pink tulips are so gorgeous, and your little flower arrangement is so precious in the bowl. 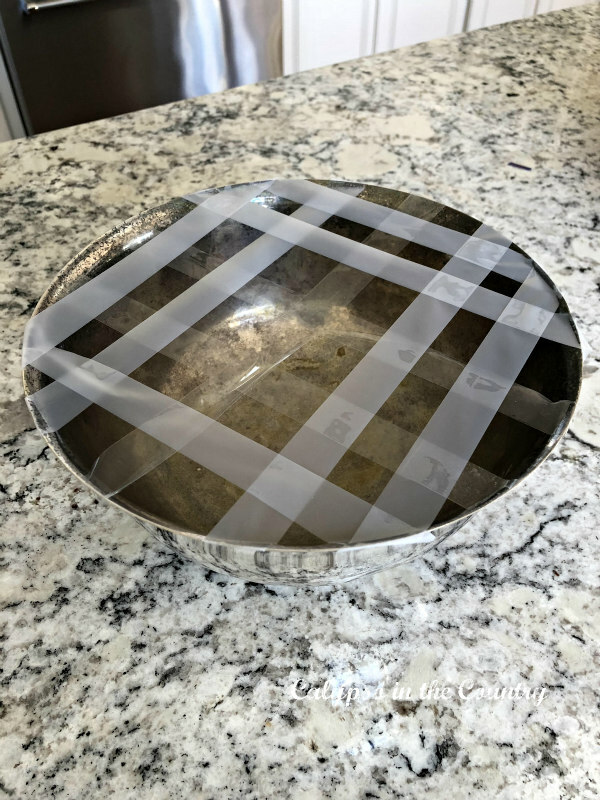 What a great idea to tape off the bowl like a grid! 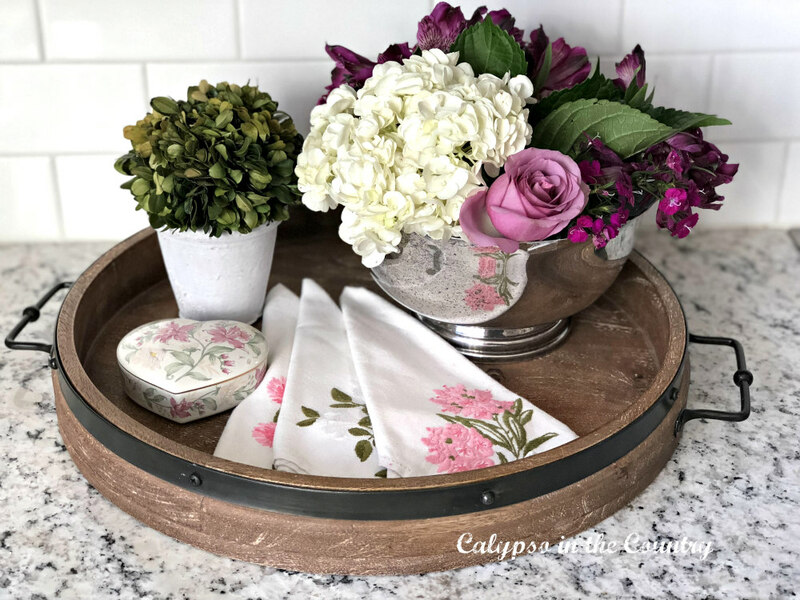 Your styled tray is perfect for Valentine’s Day. Thank you so much for joining us for this hop! Thank you Amber! When I saw the pink and purple flowers at the grocery store, I knew they would work perfectly with the embroidered napkins. Yes, I recently read that idea about taping the grid and it was SO easy! Thanks for stopping by and thanks for hosting the blog hop! I loved seeing all the beautiful ideas everyone had. Truly some talented ladies! Have a Happy Valentine’s Day! Your floral arrangement is beautiful. I agree decorating with things that have meaning to you makes everything more special. Thanks Judith! Have a Happy Valentine’s Day! Thanks Lora! I would love to have the talent to make something like that. I am honored that she gave them to me. Great hopping with you too! Shelley, both vignettes are beautiful! Those napkins are so pretty, and I know that you must treasure them so. You adorned the silver bowl perfectly. I feel it is so important to decorate our homes with things that we love and have meaning. You have done this perfectly in your displays. It has been so much fun to be on this blog hop with you! Happy Valentine’s Day!!! Thanks so much, Shannon! 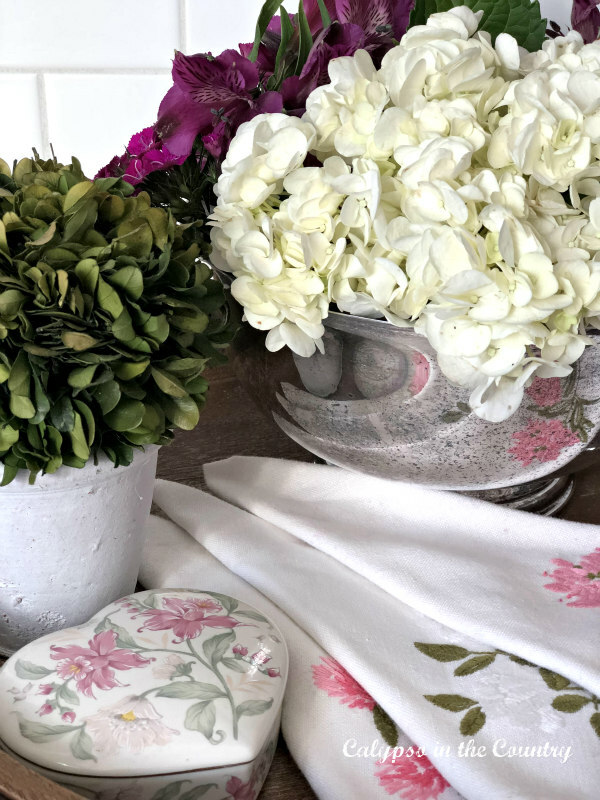 Even though I love shopping for fun accessories, I am happiest with my decor when the pieces have meaning. This blog hop really made me take a look around my house at the treasures I already owned. So great to blog hop with you too. Have a Happy Valentine’s Day! Shelley, I love love love your pretty floral arrangement in that gorgeous silver bowl. How special that it belonged to your father in law and that you have the embroidered napkins from your mother in law! They are beautiful too! Awe, thanks Lisa! Yes, those pieces are very special to us. Now that my mother in law’s health has declined over the recent year, I cherish them even more. Thanks for your sweet comment and have a great weekend! I adore all the flowers! The silver bowl that you used is gorgeous!! And those napkins are so cute and just so charming!! Sentimental pieces are always the best!! Thank you, Emily! Yes, sentimental pieces are the best. I need to look around to see what else I have stashed away. Enjoy your weekend! Classic Valentine’s vignettes are lovely and lucky you to have been gifted those priceless napkins. Thanks so much, Kippi! Yes, I felt honored to receive them! Have a wonderful Valentine’s Day! Such a stunning vignette, I am in the mood to set a nice table now. I’m going to have to go and scroll back up and take a second and third look. It’s beautiful! Aw, thanks – what a nice thing to say! Thanks for stopping by and leaving such a sweet comment! Thanks so much for your kind words and for sharing! Have a Happy Valentine’s Day, Carol!